Marvel and Sony have both said that the Spider-Man: Homecoming sequel will not feature the number "2" in its title, and will instead continue the naming convention of Spider-Man: (subtitle). Personally, we're hoping for Spider-Man: Prom. 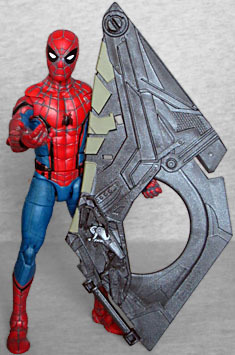 When crime hits the big city, Peter Parker suits up as New York's own web-slinging, wall-crawling hero, Spider-Man. 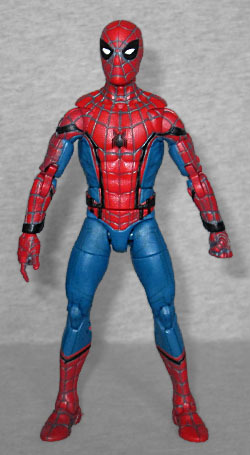 When a new-mold Spider-Man figure showed up as part of the world's least-exclusive exclusive, we told you to wait, because the mold would probably be back when Spidey got his own movie. Turns out that was only partially correct. A lot of this new version is shared with the one from last year, but it's not an exact copy. 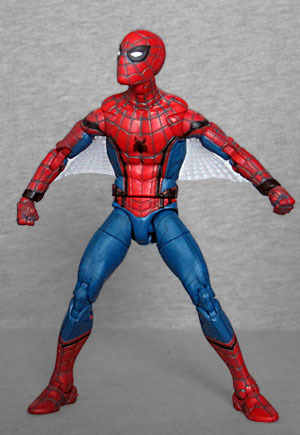 For one thing, this one has the armpit webs. Those things were dumb in the comic, and they're dumb on the toy (thankfully in the movie they're more of a "gimmick" than a "feature"). On the plus side, they're removable, so you don't have to use them if you don't want, but that also means he ends up with slots on the insides of his arms, and the things fall out easily if they bump the body at all. More than that, the bulk of the torso is new. 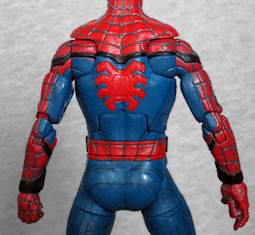 The spider symbols on both the chest and back are different shapes (more film-accurate shapes), and the chest itself is slightly wider. The abs are the same mold, but the shoulders have been redone, to change the size of the black lines on them, and the same goes for the pelvis, which also has less of a "point" on the belt than before. The extra width in the chest definitely makes him look less childish, though he's still short and has thin limbs, so the illusion isn't completely lost. The figure includes two sets of hands (fists, thwipping) and two heads. Neither of the heads is the same as the last figure, thanks to the in-universe magic of flexible eyepieces. 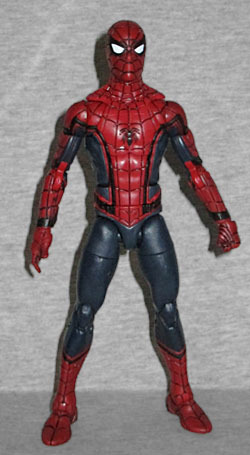 You'll recall that the Civil War figure had Romita-style eyes, mid-sized; this one comes with your choice of tiny little Ditko slits, or big wide Bagley "surprised" eyes. The paint is also different on this one. The colors are, overall, less saturated. The blue is brighter, the red is paler, and the sculpted web patterns are filled in with a light gray. Plus, the black piping or whatever you want to call that covers different areas of his body (it no longer continues down onto his biceps, for example). And to show off that this is really something made by Tony Stark, there's a gray circuit-style pattern barely visible on the blue. All the figures in this series come with a piece of the Build-A-Figure, which in this case isn't actually a figure - it's Vulture's wings. Yes, they were so huge and complex that the only way to get them is to not get them with the toy. 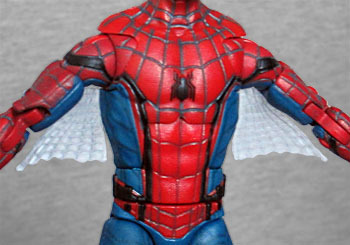 Spidey gets the middle section of the left wing. We told you you didn't need to buy the previous movie Spider-Man because there would surely be more coming. But if you did, the new one has enough changes that you shouldn't feel like you're buying the same thing all over again.